Flow cytometric analysis of live K-562 cells (blue) and SEM cells (green) using FLT3 (BV10A4H2) Mouse mAb (Pacific Blue™ Conjugate) (solid lines) or concentration-matched conjugated Mouse (G3A1) mAb IgG1 Isotype Control (Pacific Blue™ Conjugate) #14411 (dashed lines). 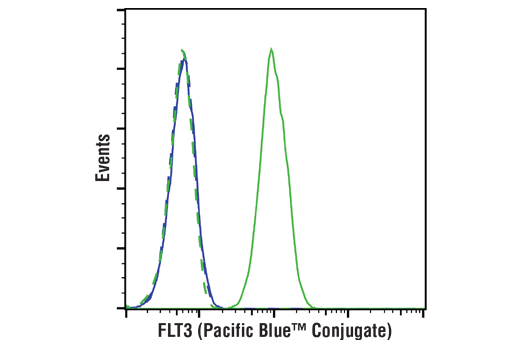 FLT3 (BV10A4H2) Mouse mAb (Pacific Blue™ Conjugate) recognizes endogenous levels of total FLT3 protein. BV10A4H2 clone is produced by immunizing animals with the leukemic cell line BV-173 and Antibody is purified from tissue culture supernatant via protein G chromatography. This Cell Signaling Technology antibody is conjugated to Pacific Blue™ fluorescent dye and tested in-house for direct flow cytometric analysis in human cells. FMS-related tyrosine kinase 3 (FLT3, also called Flk2), is a member of the type III receptor tyrosine kinase family, which includes c-Kit, PDGFR and M-CSF receptors. FLT3 is expressed on early hematopoietic progenitor cells and supports growth and differentiation within the hematopoietic system (1,2). FLT3 is activated after binding with its ligand FL, which results in a cascade of tyrosine autophosphorylation and tyrosine phosphorylation of downstream targets (3). The p85 subunit of PI3 kinase, SHP2, GRB2 and Shc are associated with FLT3 after FL stimulation (4-6). Tyr589/591 is located in the juxtamembrane region of FLT3 and may play an important role in regulation of FLT3 tyrosine kinase activity. Somatic mutations of FLT3 consisting of internal tandem duplications (ITDs) occur in 20% of patients with acute myeloid leukemia (7).